Sony Xperia Flashtool allows you to flash files onto S1 devices which range from Sony Xperia X10 to Z Ultra. 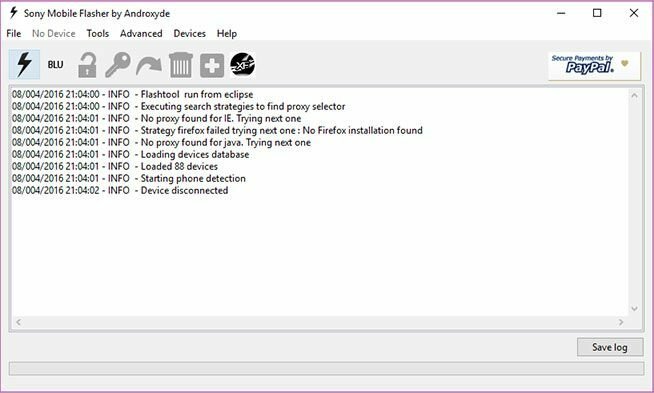 The most popular usage of this flashtool is to flash FTF (Flash Tool Firmwares) onto compatible devices that you download using XperiFirm. Situations where you might find this tool handy includes when you are trying to update your device to a new firmware or are stuck in a bootloop. The Sony Xperia Flashtool allows you some extra benefits as well. We will be discussing them all right below. Also, below, you will be able to find the latest versions of Sony Flash Tool available to download for Windows, Linux and Mac. As each manufacturer uses its own proprietary protocols, there isn’t a program that works for all. The Sony Xperia Flashtool tries to address the Xperia devices from Sony. This program also allows you to perform bootloader unlock which isn’t very common with flashing tools like this. Furthermore, it supports all the major Operating System variations. You can read further to find fast download links of this tool. Sony Xperia Flashtool can flash FTF firmwares on compatible Sony phones that utilize the S1 protocol. These FTF firmwares can be used to upgrade the OS or also, can be used to downgrade to an earlier version of the release. The tool can be utilized to unlock bootloader of the device connected easily. This makes it sort of an all-in-one scenario as you can unlock bootloader and then proceed to flashing files through this single tool. The activity and processes of the Sony Xperia Flashtool are showed directly to the user through the main interface. The log will help identify whether the flash process is running successfully and also indicate what a problem actually is rather than an unexplained error message. Sony Xperia Flashtool utilizes a graphical user interface which means you wont have to type in manual commands to get things done. All functions are explained with clickable buttons which you can press to execute once the compatible phone is recognized. It is very rare that we see such tools offering such wide range of compatibility. The Sony Xperia Flashtool supports Windows, Mac and Linux. You can download the exact version corresponding to your Operating System from below. Get the latest version of Sony Xperia Flashtool from download links given below. Note from developers: C4 and C5 users please do not flash using Flashtool. It will brick the device. M5 users please do use FSC when flashing or it will brick your device. UPDATE: Sony’s official flash tool for Xperia phones called Emma is now available. Download here! USB Drivers: You would need proper USB drivers for your specific device for Sony Xperia Flashtool to run successfully. For viewing Android USB drivers consult our post: Android USB Drivers section. You can also download Sony Xperia Companion for the latest USB drivers. XperiFirm: Download XperiFirm to get the latest Sony Xperia firmware. Custom ROMs: For AOSP based ROMs that are compatible with your device you can use our Custom ROMs section.